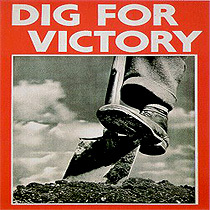 "Dig for Victory" was a Response to a Wartime Problem of Food Shortages. Throughout history one of the main reasons wars were lost was lack of food. Before the Second World War Britain imported approximately 55 million tonnes, or 3/4 of the country's food by ship each year. When the Second World War started in September 1939 shipping was attacked by enemy submarines. Cargo ships were used for war materials rather than food transportation resulting in food shortages. In October 1939 the Government launched 'The Dig for Victory' campaign. People were urged to use gardens and every spare piece of land, such as parks, golf clubs and tennis courts, to grow vegetables. During WW2 the British were digging Victory gardens in squares and public parks across the country. They were growing their own food in very tight compact spaces as a response to food shortages due to the wartime restrictions on food imports. Wartime principles of eating seasonal food grown locally and organically have a message for us now. The information is still completely current and with media fears of food shortages and economic problems there is a new interest in these techniques to grow more of your own food. Potatoes,Carrot,Turnip,Parsnip,Runner, dwarf and broad beans,Shallots,Onions,Tomatoes,Marrow,Radish,Parsley,Cabbage,Brussels sprouts,Sprouting broccoli,Kale, Swede,Globe beet,Spinach,Lettuce. Government leaflets were available and regular seasonal updated were delivered to the population as well as instructions on tool sheds seed beds and composting. See a 1942 Dig for Victory Video.